Home > Drawing Supplies | Art Mannequins, Skeletons & Other Drawing Models | Art Skeletons | RICHESON Skeleton SMALL 18"
The small 18” skeleton is an anatomically correct and sturdy tool for artists studios as well as teachers in schools. 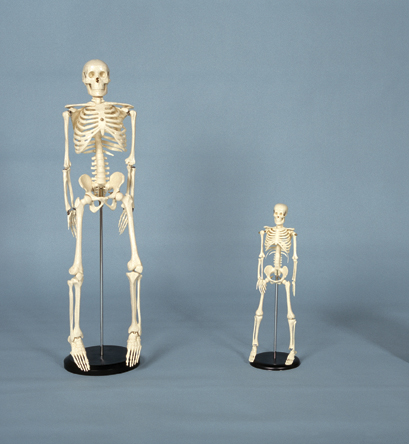 This small 18” skeleton is a marvelous tool for a variety of uses. It is a great model for artists learning, practicing, and perfecting still-life drawings. Made out of durable cast plastic resin, the stand included with the skeleton lets you see each bone from almost every angle possible. Perfect for an art studio, the 18” skeleton is a space-saver and great for drawing but also for different purposes. This model gives teachers an anatomically correct mannequin to teach students visually and enhance the learning experience. The skeleton also makes a great Halloween decoration year after year. For artists, schools, offices, and homes, the skeleton small 18” is a versatile tool. I like the product however two points of concern: 1) the metal stand rod was rusted, don't know why; and 2) the high cost of shipping from NJ to CT seemed very expensive for something so small and light. But again like the product and glad I purchased it.